Umatilla's Nathan Creason caught a pass and ran 57 yards for a touchdown with 10:41 to go in the third quarter during the game with Colton at Umatilla. Umatilla won 41-12. 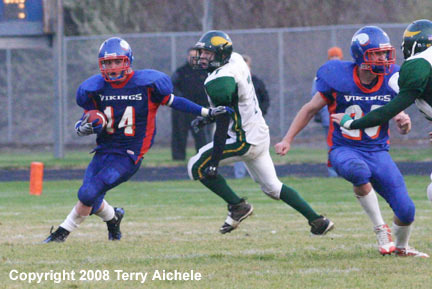 The Vikings will travel to Gold Beach to a game on Saturday, November 15. Umatilla will travel to Gold Beach for a Saturday playoff game. UMATILLA - The Umatilla Vikings defeated the Colton Vikings 41-12 in their afternoon playoff game on Saturday, November 8. The first half was a close scoring affair with Umatilla leading 6-0 at halftime. The second half started off fast with Umatilla taking four plays to score a 57 yard touchdown pass from Viking quarterback Steven Williams to Nathan Creason. Umatilla went with three running plays before opening up to Creason who caught the pass along the left sideline and ran all the way to the endzone to take a 12-0 lead. Several minutes later Umatilla took possessio following a punt at 8:01 to go in the third. Umatilla took seven plays to get to the Colton 47 yard line. That's when on second and three Umatilla quarterback Steven Williams took the ball on a 47 yard run for a touchdown. With a successful two point conversion Umatilla had a 20-0 lead. Colton took possesion on the kickoff with 4:39 to go in the third quarter. 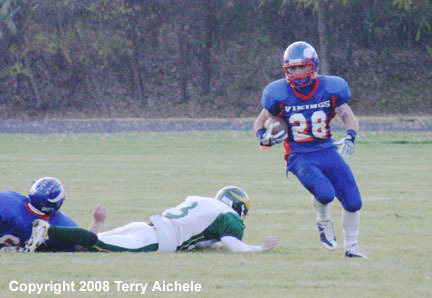 Running back Cody Dostert ran three time to take Colton to their 44 yard line. Then on a second and seven quarterback Evan Stanbro ran the counter play handing off again to Cody Dostert who took it on a 56 yard touchdown run. Colton missed the conversion which made the score 20-6. Colton's Korey Anderson picked off a pass from Umatilla's Williams with 1:57 to go in the third quarter. Eight plays later, with 10:48 to go in the game Stanbro handed off on a counter to Tanner Conner for a four yard touchdown run. This closed the game to Umatilla leading 20-12. Umatilla took the kickoff and drove to the eight yard line in ten plays. With first and goal on the eight yard line Williams handed off to Nathan Creason for a touchdown. Creason hit the extra point to give Umatilla the 27-12 lead with 6:30 to go in the game. Umatilla recovered a Colton fumble on the Colton 24 yard line with 5:36 to go in the game. 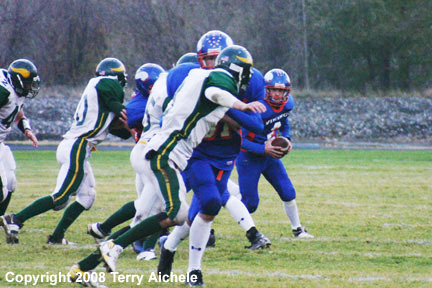 Steven Williams the Umatilla quarterback made quick work of the situation by scoring in the first play from scrimmage. Creason hit the extra point giving Umatilla the 34-12 lead. Umatilla took possession with 4:07 to go in the fourth following a Colton punt on the Umatilla 22 yard line. Nine plays later with 39 seconds to play, Umatilla was sitting fourth and four on the Colton 44 yard line. Umatilla's Steven Williams went on a quarterback keeper for a touchdown. Creason hit the point after giving Umatilla the 41-12 win. 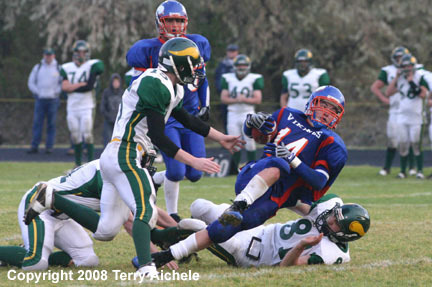 Umatilla will travel to Gold Beach for a game on Saturday, November 15. 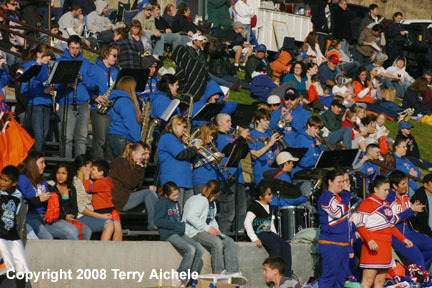 LEFT - Part of the crowd and Umatilla High School band at the game on Saturday afternoon. 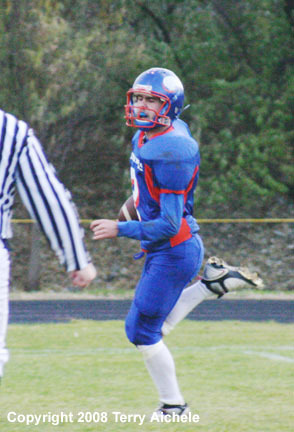 RIGHT - Uamtilla running back Nathan Creason carrying the ball during the first half of the game against Colton. 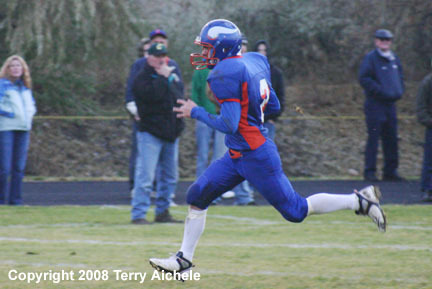 LEFT - Umatilla's Nathan Creason on a run during the first half of the game against Colton on Saturday. 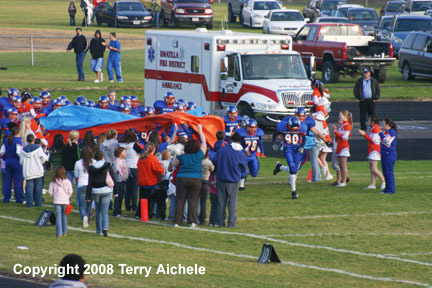 RIGHT - Umatilla football players run through a banner at the end of halftime. 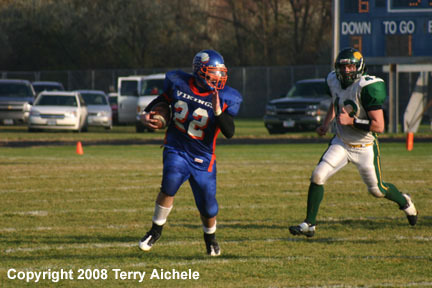 LEFT - Umatilla's Nathaniel Ten Eyck running the ball during second half of the game on Saturday. 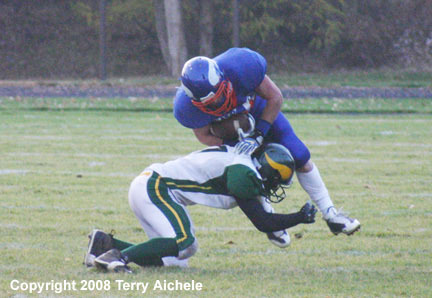 RIGHT - A Umatilla runner is tackled by a Colton defender. 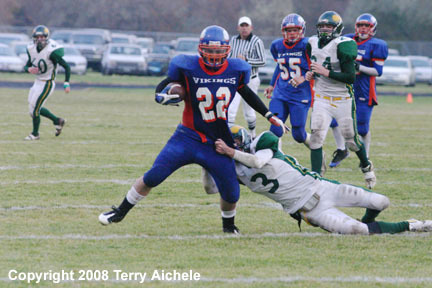 LEFT - Umatilla running back Nathan Creason carries the ball. 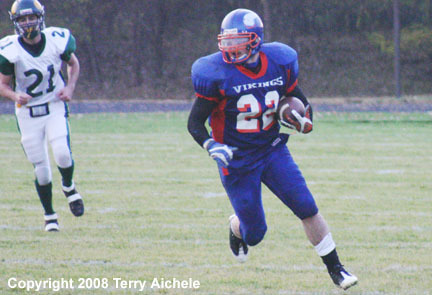 RIGHT - Umatilla running back Nathan Creason running in the clear. 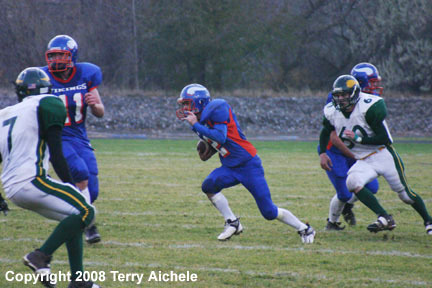 LEFT - Umatilla quarterback Steven Williams carries the ball on a run. 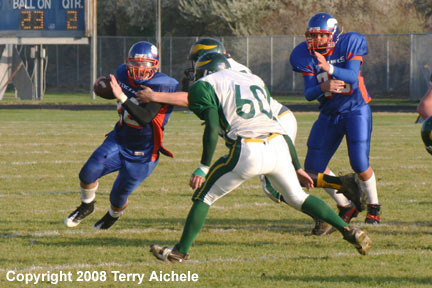 RIGHT - Umatilla quarterback Steven Williams cuts back against the flow on a quarterback keeper. 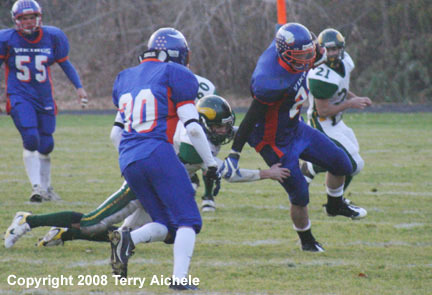 LEFT - Umatilla quarterback Steven Williams breaks into the open on a run. RIGHT - Umatilla quarterback Steven Williams on his way to scoring a touchdown. Umatilla quarterback Steven Williams crosses the goal line for a touchdown. 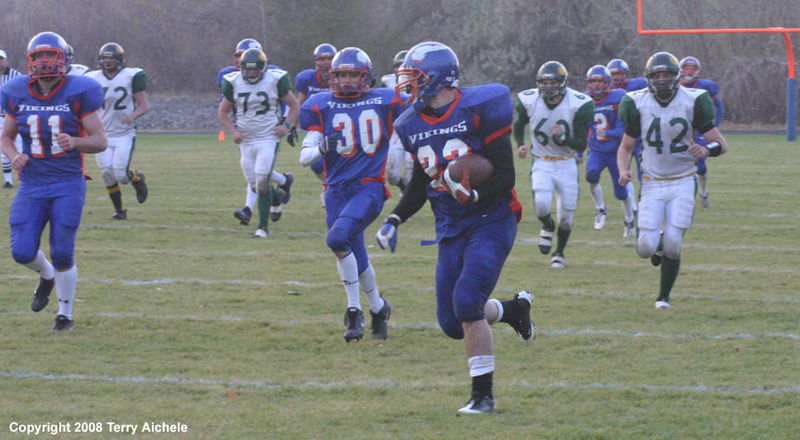 Lawrence Pankey of Umatilla looks for an opening during a run. 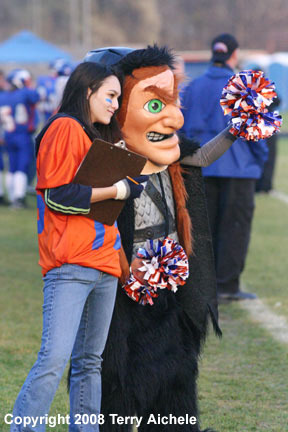 LEFT - The Umatilla Viking mascot poses with one of the Viking statkeepers. 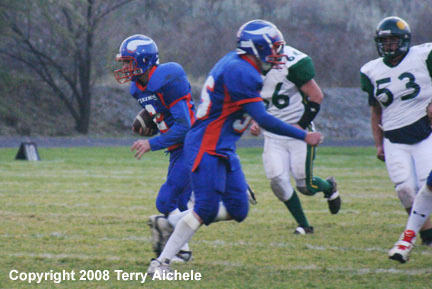 RIGHT - A Umatilla runner carries the ball during the second half of the game on Saturday. LEFT - A Umatilla runner finds an opening during a run on Saturday. 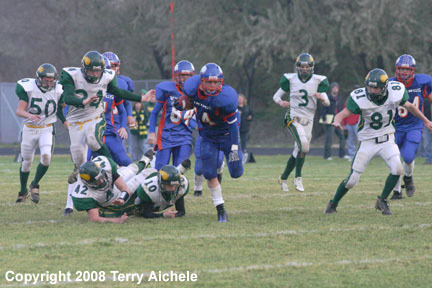 RIGHT - A Umatilla runner is tackled by Colton defenders. 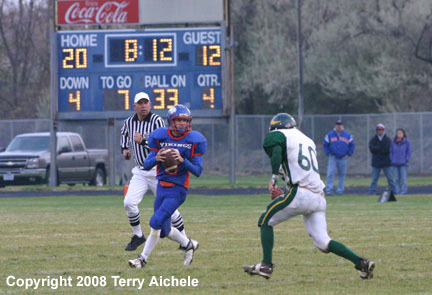 LEFT - Umatilla's Steven Williams sets up to pass. RIGHT - Evan Stanbro of Colton tries to drag down Nathan Creason of Umatilla. 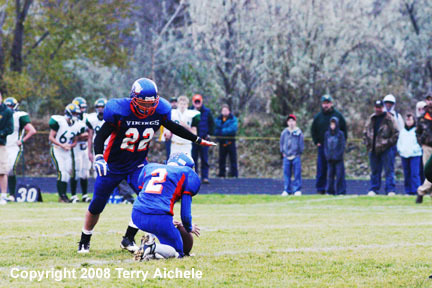 Nathan Creason kicks an extra point. Umatilla quaterback Steven Williams carries the ball along the sideline.